While there’s a lot to be said for big hitters such as Corfu and Crete, many of Greece’s lesser-known islands also have charms aplenty. 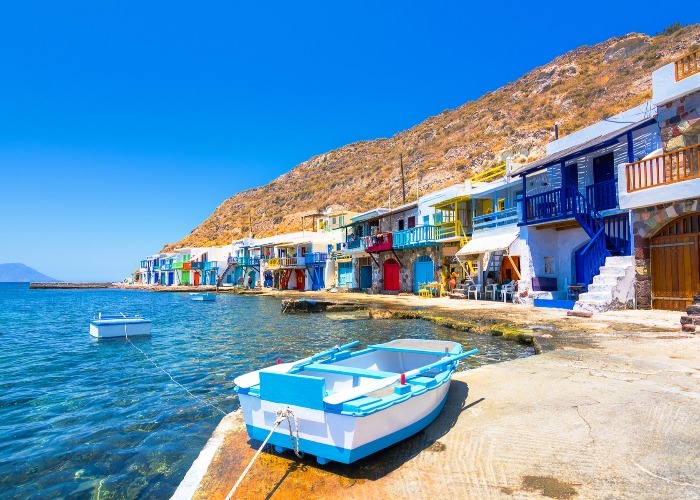 Here our Greece expert John Malathronas picks seven under-the-radar Greek islands you should have on your travel wish list for 2019. 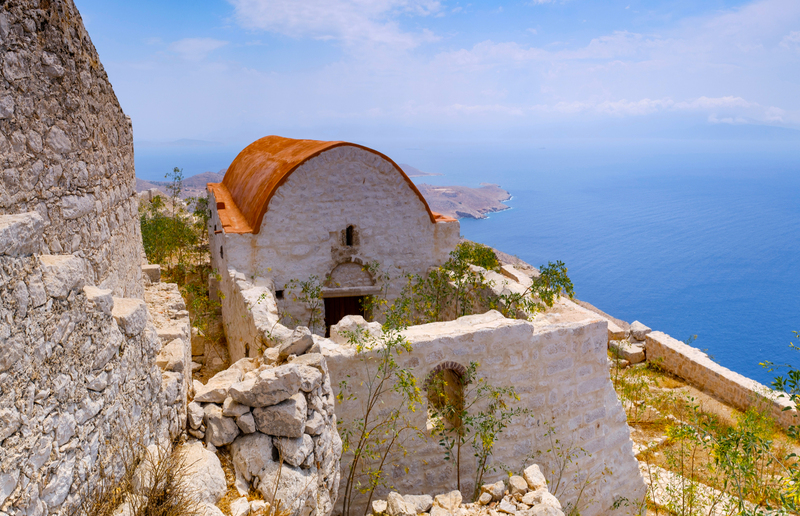 Need to know: Drifting in the middle of the Aegean Sea in the shape of a butterfly whose ‘wings’ are connected by a thin strip of land, rocky, rugged Astypalea hit the headlines when it declared its aim to be Greece’s first smoke-free island. But there are plenty more reasons to visit. 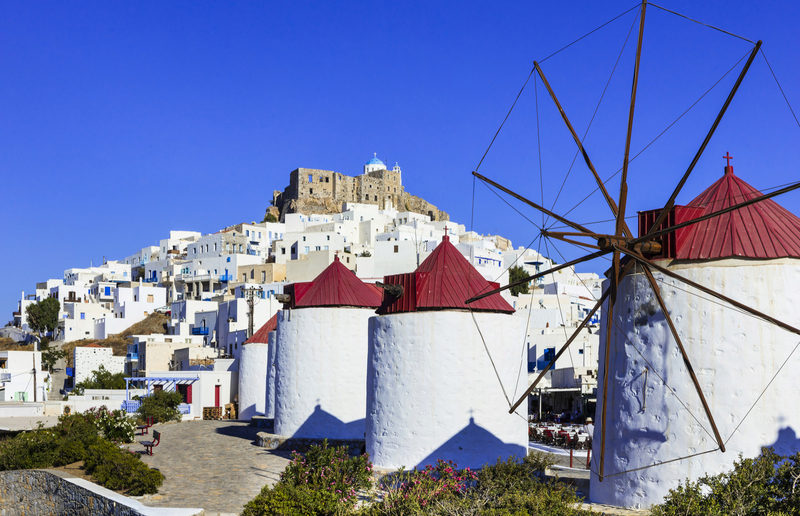 Astypalea is an out-of-the-way retreat, whose capital Chora – built on a hilltop surrounded by concentric rings of whitewashed houses and crowned by a Venetian castle – is still exhilaratingly unspoiled. Where to go and what to do: The beaches are beautiful and pristine. They range from organised strands, such as Livadia or Maltezana, a notorious haunt of Aegean pirates, to wild but approachable spots like Vatses or Kaminakia. There are also Maldives-like stretches such as Koutsomitis and Kounoupa, reached only by caïque. Archeology geeks can marvel at Hellenistic mosaics depicting zodiac symbols in the baths of Talaras or scratch their heads at a mysterious 2,750-year-old infant cemetery at Kylindra, where newborn babies were once buried in clay urns. How to get there: Travel Republic are one of the few holiday companies that can arrange holidays in Astypalea. Need to know: Standing sentry on the tip of the Peloponnese peninsula, Kythira has long been the crossroads between the Aegean and the Ionian seas, and it’s also the last port of call before Crete. No surprise then that the island has been conquered more than a few times in its long history, including by the Russians and later by the British. But it’s not just the varied heritage that attracts visitors to this island, the legendary birthplace of Aphrodite. It’s also a place whose surprising variety of landscapes have preserved its independent charm. Where to go and what to do: There are shimmering sea grottoes and forested ravines smelling overwhelmingly of wild oregano, one of the island’s main exports. There are tidy sloped vineyards and estates with centuries of wine-producing history. There is a good number of extraordinary frescoed churches, up there with the most impressive in Greece. There is also Kapsali (pictured), a relaxed resort with a twin horseshoe of beaches, and Avlemonas, whose fjord-like inlet shimmers with turquoise waters. Finally, there is Agia Pelagia, the island’s café-laden hub whose boats offer excursions to Elafonisos, an island where the sugar-fine sandy beaches may well be the best kept secret in the Med. How to get there: Notoriously hard to reach in times past, and slow on the tourism uptake, Kythira has been discovered by specialist tour operators such as Sunvil. Need to know: Although Lefkada is conveniently wedged between the mainland and the popular island of Kefalonia, it attracts far fewer tourists than its neighbour. That means its clear waters, idyllic coves, lush vegetation and dazzling beaches are less crowded and more pleasant in the summer. Where to go and what to do: The understated capital, although rebuilt after an earthquake in 1948, still has one of the prettiest settings in the Ionian, surrounded as it is by a canal, a lagoon with abundant birdlife and a natural fish farm. Further north lies Gyra, a sandy spit of a beach punctuated by windmills. The village of Nydri (pictured) has assumed the mantle of the island’s main resort and comes complete with a marina, water taxis and pleasure yachts that drop anchor in 24 beguiling islets nearby. These islets include Skorpios, the once-private domain of Aristotle and Jackie Onassis, which exchanged hands for £100 million in 2013. There’s also Meganissi, which claims several safe swimming bays, pine-forested Kalamos and olive-covered Kastos to mention but a few. Vassiliki is another attractive resort famed for its proximity to Porto Katsiki, whose rocky cliffs drop suddenly onto a blinder of a beach. You can even eschew the sea for a day, and hike to the Dimosari ravine to dive under the waterfall into a fresh water pool. 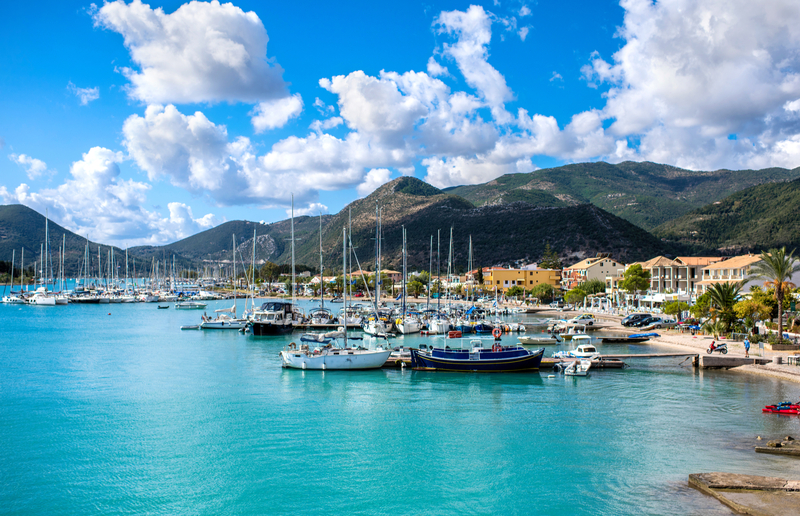 How to get there: TUI offers holidays to several destinations in Lefkada. Need to know: Chios is one of the few Greek islands large enough to be self-sufficient and rich enough not to be solely dependent on tourism. Its main export, ‘mastiha’, a flavoured resin produced from indigenous bushes, has been chewed like gum since antiquity. Mastiha can also be drunk as a liqueur, swallowed in powder form as a digestive, burned as incense and used as a flavouring in casseroles. Where to go and what to do: Twenty-odd fortified villages like Mesta, Kambi and Olympi still live off the mastiha trade, and are the oldest Greek communities inhabited without interruption. Each one is a medieval jewel sporting houses etched with sgraffito markings, set within high walls and low defensive gates. In contrast, the harbourfront of buzzy capital Chios Town stretches along the water, all modern and vibrant, as if the Greek economic crisis had passed it by. This is an island ripe for exploring: there are wondrous sea caves and butterfly-teeming springs, hiking canyons populated by sycamores, oaks and pines, plus the Byzantine monastery of Nea Moni, one of Greece’s UNESCO sites. There are plenty of unfussy beaches around the coastline, but the ones to aim for are Mavra Volia, with its striking black pebbles and Vrontados, whose solitary rock is dubbed Homer’s Seat after the famed poet. According to local lore, Homer, who was born in Chios, sat and composed his epics on that very spot. How to get there: You can book holidays to Chios via Discover Greece. Need to know: Just a short ferry hop from Rhodes, Chalki could not be more different than its jet-setting big sister. Its port, Emborió, is aflush with elegant, 19th-century captains’ mansions whose high ceilings, brightly painted shutters, shady courtyards and overhanging balconies are vestiges of the sponge trade that brought wealth to the island. Cited by UNESCO as ‘the island of peace and friendship’, it’s still an oasis of tranquillity, since the authorities allow no cars or motorcycles and the only way to get about is on foot or by skiff. Where to go and what to do: The beaches around Emborió are simple, safe and serene, but it’s the untouched northern beaches – Areta, Agios Georgios and Dio Yali – that come up trumps. You can reach them via water taxis from Emborió that also take you to the ghostly island of Alimnia, whose population was deported by the Italians in World War II for aiding and abetting seven British commandos. But, you haven’t been to Chalki unless you’ve climbed up to the enchanting ruins of former capital Horio, with its medieval castle, the Knights of St. John (pictured), offering intoxicating views all-round. 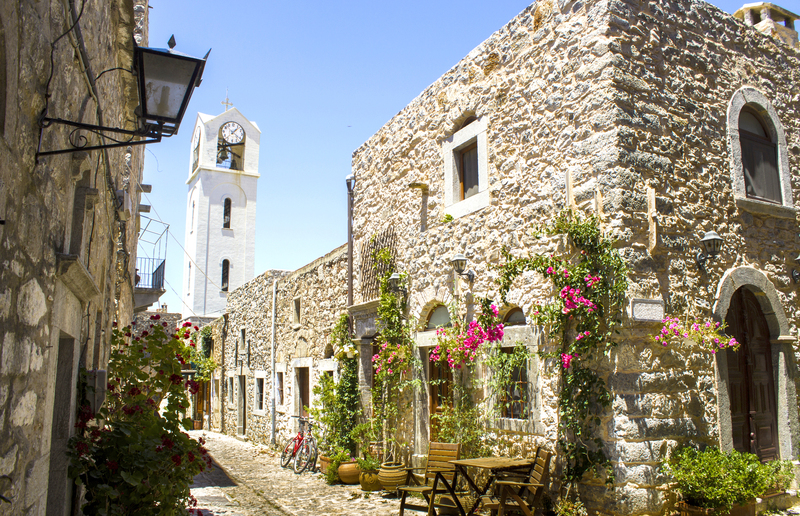 How to get there: Olympic offers holiday packages to Chalki and the island is a few hours away by ferry from Rhodes. Need to know: If it's a recharge of the batteries you’re after, look no further than tranquil Kythnos for a glimpse of Greece “as it used to be”. Only three hours by ferry from Piraeus, but twenty years behind in time, Kythnos remains undiscovered even by Greeks themselves. This is an island with only one bank and two ATMs (both in the main port, Merihas), where most hotels and restaurants don’t accept credit cards because the network is non-existent. But, despite this, the island still has everything you need and more. Where to go and what to do: The ruins of a Venetian castle stand in Kastro Tis Grias, and the isle is also home to one of Greece’s largest caves, where the whole population used to hide from marauders. Bleached-white churches with navy-blue domes house miraculous icons, and there’s a plethora of difficult-to-get-to beaches free from forests of umbrellas. 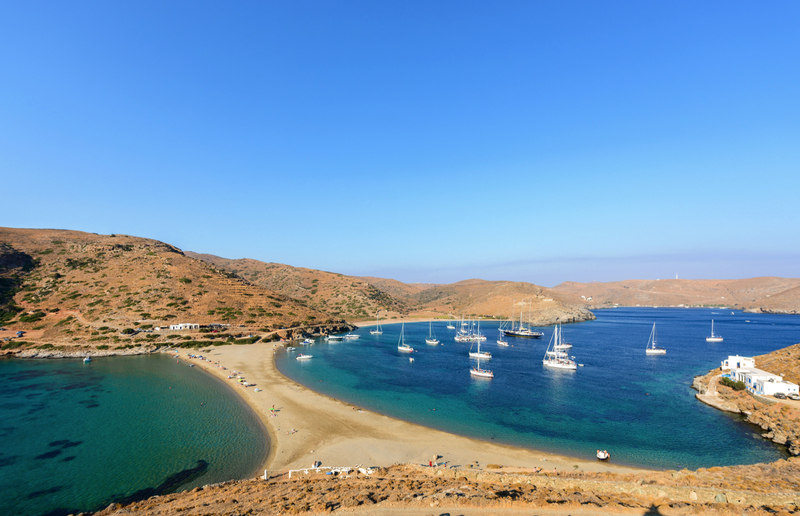 The island's pride and joy is Kolona (pictured), a 787-foot showstopper of a sandbar which joins Kythnos to the islet of Agios Loukas. It lies at the end of a dirt road that will tax even the most reliable rental car. 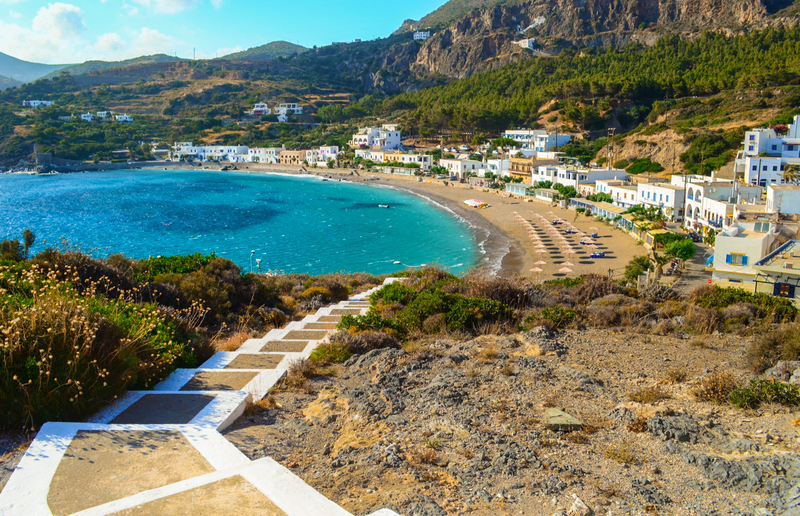 Kythnos’s alternative name ‘Thermia’ refers to its hot springs and you can still take the waters at Loutra, a petite and pretty fishing harbour. You can choose to bathe and have a massage in the council-operated spa or enjoy the springs for free in the sea, where they bubble underwater. How to get there: Sunvil is one of the few operators who can organise you a break to this out-of-the-way island. Need to know: Milos is the most spectacular of the Greek islands after Santorini, and was created by similar volcanic processes that are still geologically active. The local taverna at Paliochori beach even cooks its pot stews via geothermal energy by burying them overnight in the sand. Unlike Santorini though, Milos claims seventy-odd head-turning beaches with a variety of coloured rock formations. Where to go and what to do: Many are of Milos’ beaches are bare and wild, others are fringed by tamarisks, and some are truly astounding. Sarakiniko (pictured) is chalk-white and otherworldly, while Kleftiko is corralled by steep cliffs and is only accessible by boat. The golden strand of Chivadolimni stretches as far as the eye can see, and the narrow cleft of Papafragas feels like a natural swimming pool. The shoreline is dotted by picturesque fishing harbours like Klíma and Mandrákia, whose brightly painted boathouses (syrmata) double as the island’s most recognisable sights. The rugged western half is a protected nature reserve with a ravishing trek to the top of Profitis Ilias mountain (altitude 2,545 feet) through juniper and myrtle bushes alternating with olive and carob trees. The museum-minded will love the network of Paleo-Christian catacombs hewn into vertical rock. They’re located close to the remnants of a Roman theatre, where the celebrated Venus de Milo statue was discovered by a French soldier in 1820 and subsequently made its way to the Louvre. 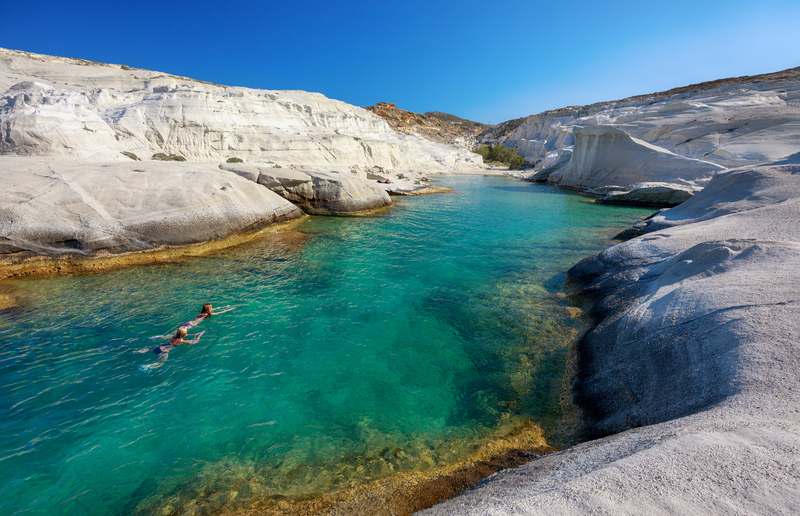 How to get there: You can holiday on Milos with Greek Sun Holidays.